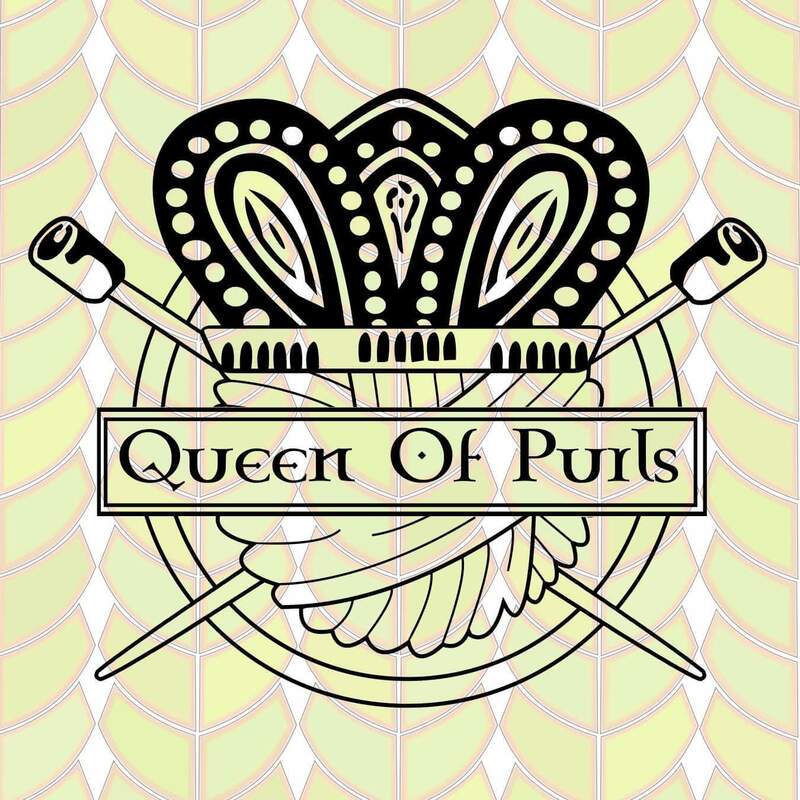 The Queen of Purls Blog – A blog by The Queen of Purls in Glasgow, Scotland. The Queen of Purls will be relocating to The Hive in Finnieston. This decision has come after being informed of a significant hike in rent after the initial lease of 4 years expires in March. There are many other reasons as to why I have chosen not to renew the lease at 91 Saltmarket – the decision was not taken lightly. The place was literally a dump when I first took it on and it took my Dad and I a solid two months of renovation to get it into shape. I’ve put my heart and soul into the shop and many others have too. I’ll be extremely sad to leave, but circumstances change with time and you have to change with them. Looking forward to our move and new home, Aefa and Joe who own The Hive and The Hidden Lane in Finnieston have both been amazing in helping me find a place to move short notice and have been overwhelmingly welcoming to me. I’m excited to have them as my new Landlords and to be part of their already vibrant community! After Saturday 17th, I will be closed until opening at The Hive which will be near the end of March. To help clear stock for moving I will be offering a 15% discount and all yarn, excluding Queen of Purls Hand Dyed, from today up until we close on the 17th of February. This will be available online too so come grab a bargain! Use code EJY48TR392VF at the checkout to receive the discount! O.K deep breaths all round as we move into this new era for The QoP!!! Chloris is the ancient Greek Goddess of flowers and spring time. The name Chloris means means “pale green” and “fresh.” Think of the spring greens you see when bulbs start to sprout and show through the ground and the fresh green buds of leaves on trees! The Chloris Cowl celebrates the Wheel of the Year turning to spring with the promise of longer and warmer days. Spring flowers bring us the first show of colour for the year, and I always think they are the most magical. It’s like their presence thins the veil between worlds and you can see the fairy folk dancing in amongst them in skirts made of petals and hats made from Beech nuts. 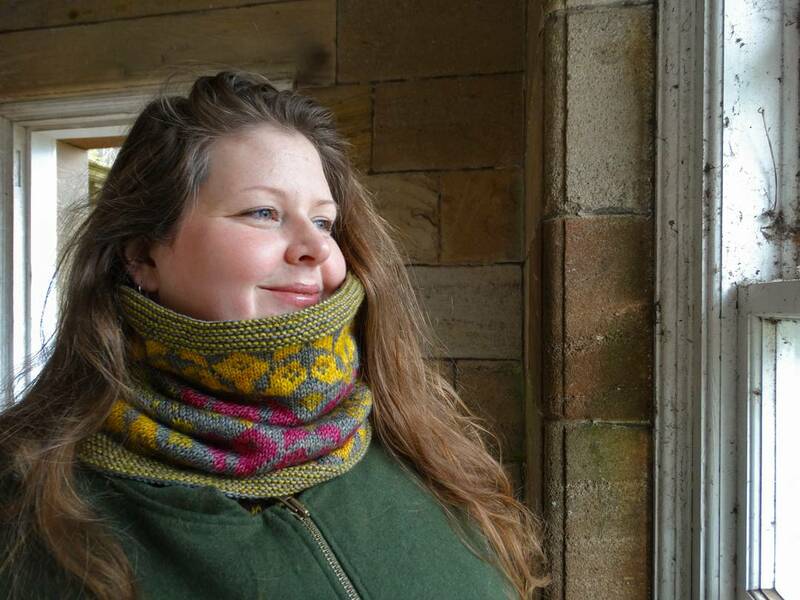 When designing the Chloris Cowl I wanted to evoke a feeling of spring and secret gardens. Gardens that are long forgotten, where nature is free to roam and vine it’s way through once well kept spaces. A garden no one else knows about but you stumbled upon one day and felt safe and protected within it’s boundaries. A place where you might catch a glimpse of a magical creature fluttering past! The Chloris Cowl is a close fitting cowl with plenty of length to pull up over your ears while still keeping your neck warm. Knit in the round using stranded colourwork to create bright and bold floral motifs, Chloris is designed to bring colour into your world when the start of the year is still grey and dreich. The sample is knit using Queen of Purls Hand Dyed Citadel DK in Space Junk, Swamp Thang, Flowers of Sulphur and Love Lies Bleeding. Citadel DK it a 100% British Blue Faced Leicester which gives the cowl a lovely drape with that beautiful silk-like lustre which BFL is known for. It’s started and finished with striped garter stitch rounds which gives it a modern and fresh feel. The pattern calls for the colourway Swamp Thang to be used as the contrast colour for the garter stitch, but you could use any of the contrast colours that you like. There are also 8 rounds which require the use of 3 colours at once. If you are comfortable with stranded colourwork, this should be relatively easy if you’ve not done it before. To finish the cowl, a version of the Icelandic Bind Off is used which makes an edge that is practically identical to the Long Tail Cast On that the pattern calls for. I will I’ll be providing video tutorials of how to manage your yarns for the long floats and three colour rows and a couple of other techniques used in the cowl. Full disclosure – I have lost my camcorder and tripod so there will be a delay between the pattern being published and the video tutorials being made. I’ve turned the shop and my flat upside down looking for them to no avail. I had planned for the tutorial to be live at the time of the pattern release, so please bear with me, I’ll get them up one way or another soon! Morning update – I found the camcorder and tripod!!! Tutorials will be up next week! Find the Chloris Cowl pattern on Ravelry here! Use code GREENTHUMB for 25% off the pattern price until 23.59pm on 14.01.18! How To Make A Perfect Tassel Queen of Purls Style! 1. Start making a tassel as normal & tie the top to secure. I’m using a different colour so you can see easier, use any colour you like! 2. Grab a length of yarn about 30 cm (this really depends on overall length & thickness of your tassel but for a small one 30cm is fine!) that you want to tie your tassel with & fold it about a third of the way & place on top of your tassel as shown. Make sure the long length is at the top, the short length at the bottom & the ‘loop’ at the bottom of the tassel. 3 & 4. Now take the top, the longer length, & bring it down over the top of the shorter length (pic 3), then take it under & back over the top to start wrapping it. Keep wrapping in this direction working from the top of the tassel to the bottom. Wrap neatly so each wrap lies directly next to each other & wrap it TIGHTLY! 5. Keep wrapping until desired length but don’t wrap completely over that loop you made at the start. Thread your working yarn through the loop from top to bottom. 6. Pull the top piece of yarn, that short bit that you folded over earlier that is at the top of the tassel. You’ll start to see the loop tightening & disappearing under the wraps. Keep pulling until the loop disappears completely under the wraps, but don’t pull until it comes out the top again, you want it to be hidden! At this point I like to pull on both ends at the same time just to tighten everything nicely. 7. If you do want to use a different colour for this part of the tassel you can trim the ends flush to the wraps. If you wrapped tightly enough they will stay secure. If you are using the same colour, or more than one colour so it will blend in, you can trim the bottom length of yarn to the same length as the rest of your tassel. Thread the top length of yarn with a needle up & over the top, under the knot you tied the top of the tassel with, then down the other side & back under the wraps on the other side. Again trim to the length of your tassel. 8. Pull any unruly pieces into place & give a final trim if needed. Now you have a perfect tassel with a wrap at the top that also looks perfect all the way round! When I was a teenager, my friends and I would always make the trip east towards the Trongate when we came into town on a Saturday. We’d check out a small army surplus store on the Trongate for old army jackets which were every alternative kid’s winter jacket of choice, Record Fayre for CDs and those black hoodies with your favourite band logo on them, then we’d all head up to 23 Enigma on High Street. We loved checking these shops out week after week. The big, mainstream shops of the town centre held no interest for us and were just that; mainstream. We didn’t identify with what they were selling and didn’t want to. We wanted to express our own voice and these were the shops that provided an alternative so we could do so. I have good memories of this part of town, from my Mum bringing me into town when I was younger and taking me to The Big Top, seeing the Red Hot Chili Peppers play at Glasgow Green (probably whilst wearing my RHCP hoodie that I had bought from Record Fayre), and watching the amazing kinetic sculpture shows at Sharmanka Kinetic Theatre. When the time came to start looking for a shop unit for The Queen of Purls this wasn’t an area that immediately stood out to me though. The area has had its problems and has a lingering reputation as a bad area of town. It is also rich in history, being the heart of Glasgow where Glasgow was originally formed. There are regular world class events being held at Glasgow Green; the 2014 Commonwealth Games were hosted there and the World Pipe Band Championships is a regular every year. These are events that attract people from all over the world and there is no shortage of things to do and see in the area when they visit. It has good public transport access and it’s walking distance from the centre of town; all important points to consider when opening up a shop! The more I visited units in this area, the more I remembered how much I enjoyed coming to this part of town. If you look into the history of the Saltmarket you’ll find it was originally named Waulcergait as it was known for wool production. It was when merchants in the street started selling salt for curing salmon that it was renamed Saltmarket. Eventually, I opened my shop here. Despite all this, there is one question that people keep asking. Where are all the businesses? If you’ve been to the shop you may have noticed many a vacant shop unit in the area. The shop units available here are all owned by the council. When I was looking for my shop there were a few units in the area, but not all of the shops lying empty were being advertised. Three and a half years into my lease they have still not been advertised as being up for rent. I’ve had people from several organisations come into my shop asking for ideas on how to fix this and plenty of ideas have been put forward. The council has been approached with ideas, but they all seem to be rejected. It seems they are happier getting no rent than letting people have a shot at building a successful business. Businesses in the area are being hit with the charges for historic repairs to the buildings they set up shop in. I myself was expected to pay a VERY large sum of money upon signing my lease for repairs to the building that had absolutely nothing to do with my yet to be realised business, but because of the type of lease you sign as a business owner, I would have been liable for them. News stories are being published about historic buildings that are in line to be demolished to make way for student housing. There’s something not right going on here and none of the businesses that have been asking what’s going on are getting any clear answers. What council would want a historically rich part of their city to remain vacant from business? This area could and should be what it once was. Thriving small businesses that offer a shopping alternative to the big and often mundane businesses of the City Centre and help create a sense of community. Small, independent businesses bring life and soul into communities. They are often run by people who live in the community themselves. They offer something different, something more ethical, they give back to their communities and they provide colour, texture and narrative in a world of banal mega stores designed to blend in and purposefully not be different. I’m not the only person who feels this way and was absolutely delighted to take part in the High Street & Saltmarket: Past, Present, Possible event organised by WAVEparticle on the 22nd of July. This event celebrated the past history of High Street and Saltmarket, the present day lives of residents and retailers and looked to the possible future of the area. The team at WAVEparticle made one hundred and one flags and standards which were flown during the Merchant City Festival Carnival procession. Each one had an image that represented the businesses on the High Street and Saltmarket and the history of the area. The Queen of Purls was represented by a ram! After the carnival had passed, we walked down High Street and Saltmarket towards the Briggait with flags flying and gave cheers to each business we passed on the way that was involved with the parade. It was a real boost to morale to hear everyone cheering for the businesses we passed. It gave a sense of pride to those who have made High Street and Saltmarket their home. When we reached the Briggait we listened to a presentation from the Scottish Civic Trust on the history of the area and were all treated to lunch. Around us, the WAVEparticle team was quickly setting up a pop-up exhibition of the flags. The enthusiasm the WAVEparticle team brought to the event was much needed. For some businesses there have been years of struggle and dealing with a council who doesn’t seem to care about the residents or the businesses here. It was nice working with people who genuinely do care. It was exciting and invigorating seeing and being part of a project that actually came to fruition, especially one where every member of the community was included and invited to participate. It is roots movements like these that make a difference for people in the area and attract those from out with. I hope this was the first of many celebrations of life on the oldest line in Glasgow and that it can once again thrive as a shopping destination as it used to. Residents should feel proud to live on these streets and potential business owners and start ups should find it a desirable area to open a business, as I did when I signed the lease for 91 Saltmarket.